Dogs are animals that are member of the genus Canis and has been domesticated for thousands of years. Dog History: Today's domesticated dog is a descendant / subspecies of the gray wolf. Dog Size: Dogs come in a variety of shapes and sizes. The smallest dog breeds weigh just a few pounds, while the largest dog breeds can weigh up to 250 lbs! While dog breeds may appear quite different, anatomically they are all the same. All dogs have 321 bones and 42 permanent teeth. Dog Breeds: There is little agreement on the actual number of recognized dog breeds. Designer breeds have developed over the years, but they are not usually recognized as official breeds. The AKC (American Kennel Club) recognizes more than 150 breeds. Diet: Dogs are classifieds as carnivores, but they will healthily digest a variety of foods, including vegetables and grains. In 2001 it was estimated there were 4 million dogs in the world! Senses: Dogs have an exceptional sense of smell, the sensitivity varies from breed to breed, but it is by far their most developed sense. They use their sense of smell to identify people, pets, their environment, prey and much more. Dogs have good vision, they are able to easily notify motion or movement in their line of sight, and there night vision is superior to that of humans. A dogs sense of taste is not overly developed, they rely on their sense of smell to determine if they like something. Behavior: Dogs are invaluable to humans in the western world. Dogs have been known to perform a variety of tasks and fill many roles for people, such as hunting, herding, pulling loads, protection, assisting police and military, companionship, and assisting disabled or handicapped individuals. 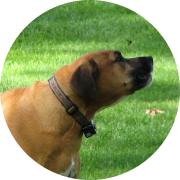 Communication: Dogs communicate using body movements and vocalizations. They can express dominance and submission using their body position. They can vocialize to express fear, excitement or a number of other emotions. Dogs also express themselves using their ear postion, eyes, mouth, nose, head, and tail. They are really very expressive animals. Dog Gestation: Dogs carry their young 56 to 72 days. Dogs are said to sleep an average of 10 hours a day. Birth: An average dog litter consists of 6 puppies, but litter sizes can vary from breed to breed. Sexual Maturity: Dogs are sexually mature between 6-12 months of age. Life Span: The life span of dogs vary from breed to breed, in general small dogs tend to have longer life spans than large breeds. The average dog life span is 10 - 14 years. Social Structure: The basic unit of canine social structure is the pack. Like many animal social grouping, there is usually a "pecking order". Some dogs breeds are more social than others, dogs will assert dominance over other dogs, problems may occur when two "alpha dogs" are in the same pack. Some dog behavior specialists suggest that dogs see their owners as parts of their pack. Athleticism: The athleticism of dogs varires from breed to breed. Some of the hunting, sporting and working dog breeds are quite athletic and agile.